The story begins by introducing us to Clara Williams and Jack Standing, who are brother and sister. Jack has been trained for the clergy at the instigation of “a devout and love-blinded mother,” although he is unsuited for the job. His sister, it seems, is made of sterner stuff, but, of course, she’s a girl so never mind. The church fathers decide that Jack could never stand up to “the trials and temptations” of a city parish, so they decide to send him to the countryside. Jack, with visions of worshipful señoritas dancing in his head, agrees to go and sister offers to come along to help him get established. Unfortunately, the town they send him to, Placer Center, is a wild frontier town, with just a small contingent of church-goers, derisively known as the “Pettycoat Brigade.” Most of the town spends its time drinking, gambling, whoring, brawling, and especially shooting at each other. You’d think the population would rapidly diminish. 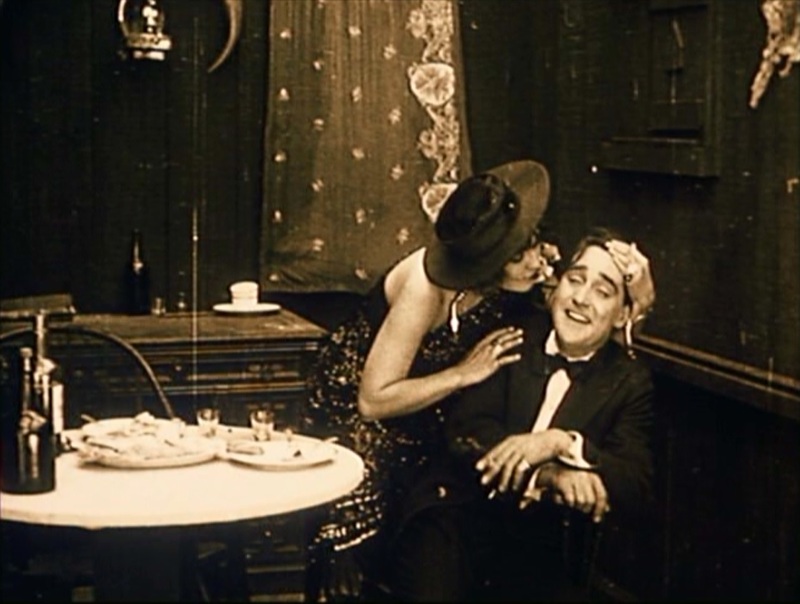 Among the rowdies who constitute the real power in this town are two friendly rivals: “Silk” Miller (played by Alfred Hollingsworth) who runs the local saloon and apparently pimps most of the “dancing girls” in town and “Blaze” Tracy, played by William S. Hart. Tracy is your typical jaded gunslinger – a man of few words who rarely smiles and always seems alone, even in a crowd. The cinematography emphasizes this by isolating him in many shots, even when we know other characters are nearby. These two have an agreement to keep law and religion out of “Hell’s Hinges,” as the town is colloquially known. Tracy plans to intimidate the new preacher, and he goes to meet the stagecoach when the newcomers arrive. But he is smitten when he sees the purity and goodness of the sister, and he removes his hat respectfully, to the consternation and confusion of the rowdy onlookers who were hoping for a good show. The preacher sets up in a converted barn and tries to give a sermon, but the local rowdies show up in force and outnumber the flock. They begin dancing and whooping it up in the aisles. Tracy sees this, and just as he turns to walk away from the whole affair, the sister begins to pray and he seems to hear it somehow above the clamor. He runs the rowdies out of the church, telling them to leave the parson’s “herd” alone. He then sits down and listens to the sermon. Although he doesn’t give much indication of understanding it, he is moved to go home and read the bible while drinking whiskey and smoking. He comes across a passage in which God claims to answer prayers, and prays for the girl. Let me rephrase that, he prays for God to give him the girl. Unseemly behavior in a clergyman. Silk Miller decides to try a different approach and invites the parson to preach to his girls, choosing Dolly, an especially sultry one (Louise Glaum, doing her best impersonation of “Carmen”), to hit on the preacher. The preacher, being weak, agrees to help her celebrate her birthday, and winds up drunkenly passing out on her bed (whether anything else passes between them is left to the imagination of the audience). Silk arranges for the whole town to see the parson’s condition and Tracy rides off to find him a doctor. While he’s away, Silk gets the parson drunk again and suggests burning down the church. The rowdies love the idea and the drunk parson goes along with it as well, even though several of his flock stand by with shotguns. During the battle, the minister is shot, but not before setting the church ablaze. Everyone scatters except for the sister, who cries over her brother’s body. Tracy returns to town to find what has happened and walks resolutely into the saloon. He sets it afire as well, telling the patrons that they’ll be feeling hotter flames soon enough after they die. The whole town catches fire, and he walks away while the remaining townsfolk run around in a panic. Evidently no one in Hell’s Hinges has heard of a bucket brigade. Tracy takes the sister off into the hills and they bury her brother in what seems to be relatively lush ground (we see trees and grass for the first time in the movie, I think). He assures them that their future together will be brighter than the past. Like a reversal of Adam and Eve, apparently now they have escaped the evils of the world and found an Eden. I enjoyed this film as much as any other western I’ve watched in this project – probably as much as “The Squaw Man” with Dustin Farnum at least. As far as his being darker or more “serious” than Gilbert M. Anderson, well, this movie reminded me a lot of “Broncho Billy’s Sentence” and “Naked Hands” at different points, but, I have to grant you that the apocalyptic ending outdoes anything I’ve seen from Anderson. Anderson’s movies are mostly shorts, as well, so there isn’t as much time for character development and plot complexity, although this movie has its share of shortcuts, such as the bad gunman instantly reforming upon sight of an innocent and pretty young woman. As far as plot holes, my other big question is why the heck does Hart go riding off into the desert at the critical moment? There was (and is) no known medical cure for alcoholism and since the preacher is well enough to go out drinking the next night he had no other immediate medical needs. Hart would have done better to stay home and sit on him. 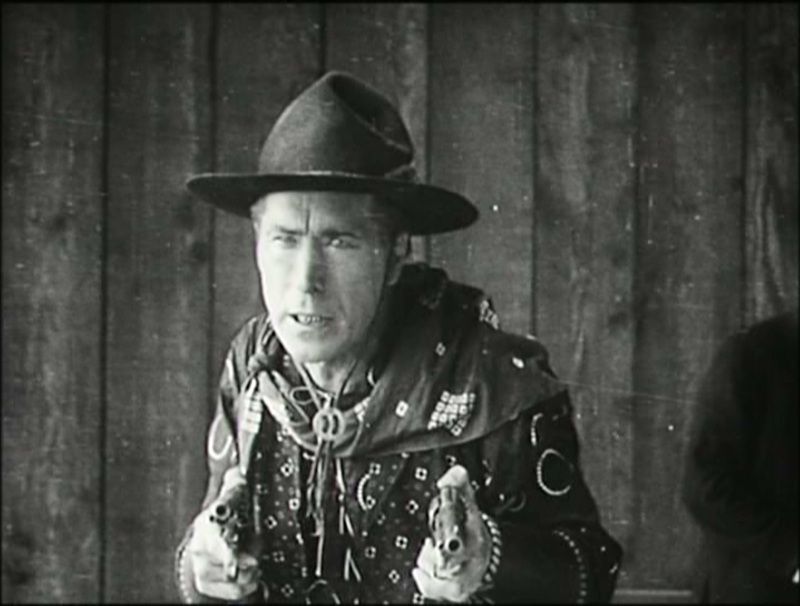 The Intertitles are oddly poetic – the narration sometimes slips into purple prose that reminds me of Intolerance (“The eternal, unconquerable, white flame that shone over the blood-drenched Roman arena, and above the racks of the Inquisition”), while Hart’s dialog is brutally colloquial (“I’m shootin straight tonight and I’ plum willin to kill!”). This movie was made by Thomas H. Ince’s New York Motion Picture Company, which in spite of its name was one of the first major studios working in what is today Hollywood. It has all of the benefits of the location and the company’s long experience with making Westerns. 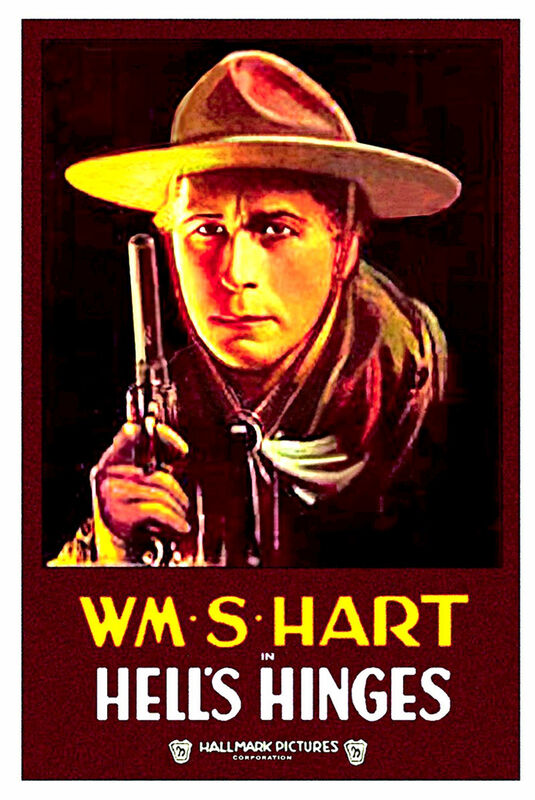 There’s some debate about the directing, but evidently it was shared between Hart and the credited director, Charles Swickard, with Ince present in the capacity we would today recognize as Producer – a division of labor that was pioneered at the New York Motion Picture Company. I was impressed by the cinematography of Joseph H. August. 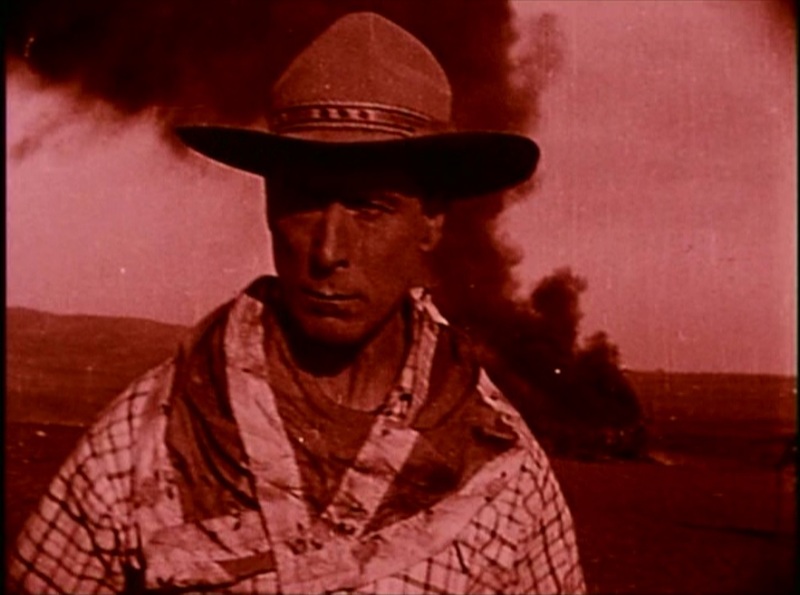 I mentioned above how often he isolates Hart from the crowd, and he also sets up several shots with Hart walking toward the camera while some dramatic backdrop (like the burning church) emphasizes his mood. There’s also a nice use of color-tinting to suggest time and mood, and some creative camera angles. Hart himself pulls off some very nice horse-stunts during his dramatic ride back to the town, including a jump-mount and one part where the horse appears to tumble down a sandy cliffside, only to leap up and charge toward the camera after hitting bottom. In short, the movie makes excellent use of all the methods and tricks of cinema at this time, combined with a good (if at times contrived) story and a great star, making for a very satisfying view, as well as a historically important one. You can watch it for free: here (no music), or here (with music). Excellent review! Sounds pretty wild, what with all the drinking and debauchery in the aisles at the church service, and the pastor burning down his church and Hart burning down the saloon and everything else. Is this unusual or typical for westerns of the time? 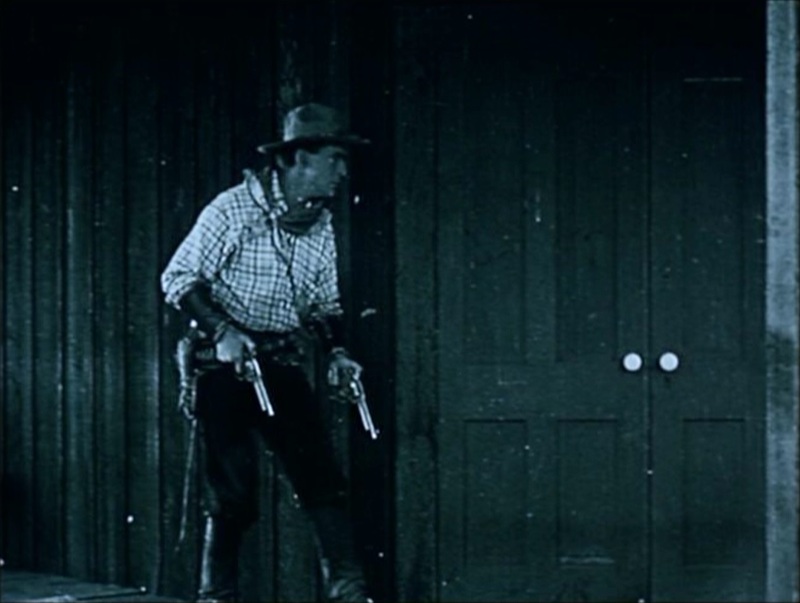 I always wonder if any Hollywood westerns get at the real chaos and instability of the era and its almost nonexistent law. 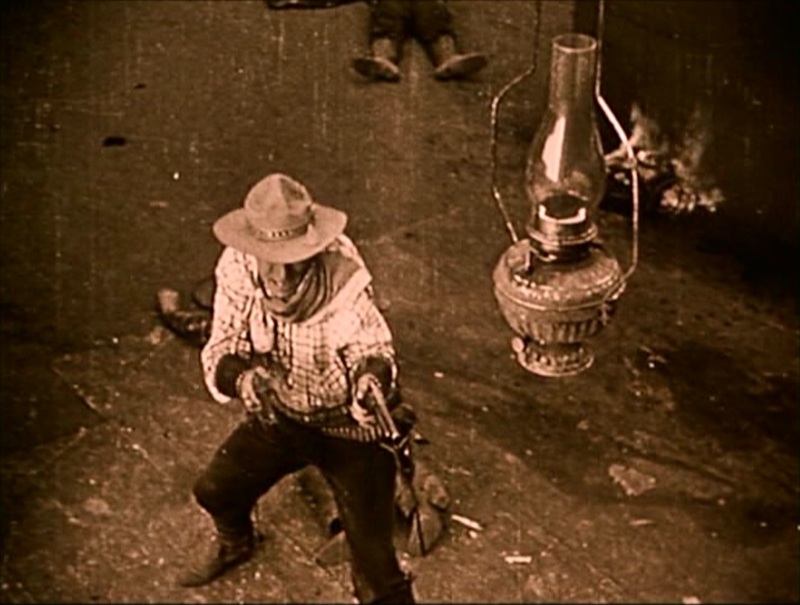 Of course the revisionist westerns of the ’60s (thinking The Wild Bunch) and Monte Hellman’s westerns with Nicholson, and of course McCabe and Mrs. Miller and Little Big Man tried to convey some of this messier reality, but I wonder if these much earlier silent westerns might not have the edge on account of proximity in time (not that that guarantees any sort of fidelity to reality). But my mother’s mother grew up the daughter of an itinerant ranch foreman, in Arizona, New Mexico, and West Texas. She was born in 1911, and the world and life she describes were pretty wild. This is a fairly exceptional film, although part of the romance of the West has always been the ostensible anarchy of the situation. As I suggested in the review, a small town where people killed each other this often would be devoid of people in a few weeks! There’s elements of this even in Broncho Billy’s more kid-friendly Westerns, where drinking beer or fighting with your fists is considered “Eastern” and weak. 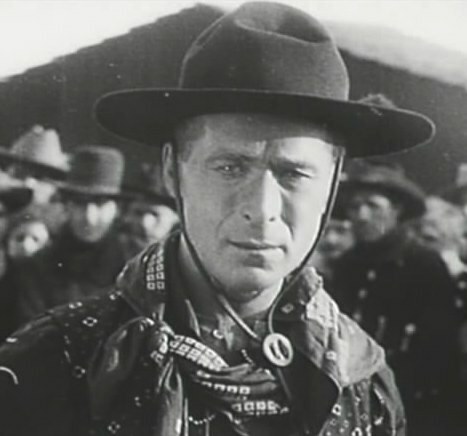 But, I think this movie goes farther in terms of having sin on a pre-code level (suggested, not shown) and a completely nihilistic attitude towards Western values.